It seems the only question about new Pixar movies is whether they will be successful, wildly successful, or insanely successful. Although it’s certainly true that plenty of really good movies never see enormous money at the box office (for a number of reasons), it is almost never true that truly awful movies have enormous paydays. The reason is that while some folks may get suckered into seeing a new release based on marketing hype, if it’s a stinker, they won’t be back to see it again. Nor will they buy the DVD. And they’ll make sure their friends don’t waste their money, either. So while box office receipts don’t provide all the information, it’s a pretty safe bet that an animated film that has grossed over a quarter of a billion dollars so far has got more than a few things going for it. 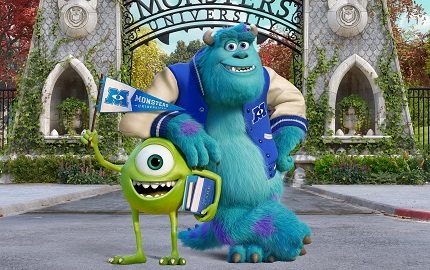 Monsters University is a prequel to Monsters, Inc. (2001), and it gives us a peak at the roots of the relationship between Mike Wazowski and James P. “Sulley” Sullivan. Turns out, they weren’t always the very best of pals. In fact, they couldn’t stand each other when they first met at college. Mike, as a six-year-old monster, goes on a school field trip to Monsters Inc. and, after watching a professional scarer at work, decides he has found his life’s calling. Despite his small stature and overall lack of scariness, Mike pursues his dream and ultimately enrolls in the scare program at Monsters University. On the first day of class, Mike’s hard-earned knowledge and enthusiasm are overshadowed by a rather imposing, large, blue monster named Sully. Sully’s arrogance is fueled by his size and his pedigree, since he comes from a long line of scarers. The two mismatched monsters do not see eye-to-eye (er, eye-to-eyes? See, that’s funny because Mike only has one eye, but Sully has two. Never mind.). As is usually the case with prequels, we know how it’s eventually going to work out, because we’ve already seen the original movie. What we don’t know is how they work it out, and that’s what makes a good prequel fun. And this is a very good prequel. As with all Pixar films, Monsters University is full of solid storytelling with virtually no fluff or fillers. Multi-faceted characters are fleshed out in interesting ways, and we truly care about them. As a result, we want to root for them and cheer them on, even if they fail miserably. Good storytelling applauds effort over results, and honest responses from characters help suspend disbelief, even in the face of unbelievable situations. This is a family-friendly film through-and-through, full of laughs and funny scenes. There is some drama and suspense, but nothing so terrifying that a youngster couldn’t cope with it, especially if they’re sitting next to Mom or Dad. And there are some great lessons taught about friendship and loyalty and choices and consequences. Make sure you stick around and enjoy the credits; they’re full of little graphic gags that are well-worth watching as the legion of names rolls past. And, if you stick it out all the way to the very, very end, you get the payoff to a joke setup much earlier in the movie. Bottom line: watch this film. The folks at Pixar, as per usual, have put together a virtual advanced course in effective storytelling. No all-night cramming for exams or cold pizza for breakfast required, just enroll your family in a 104-minute correspondence course offered exclusively from Monsters University.